When it comes to our dogs (and their owners), we don’t compromise on quality or transparency! Super premium facilities for super premium dogs - well that’s what we believe anyway! 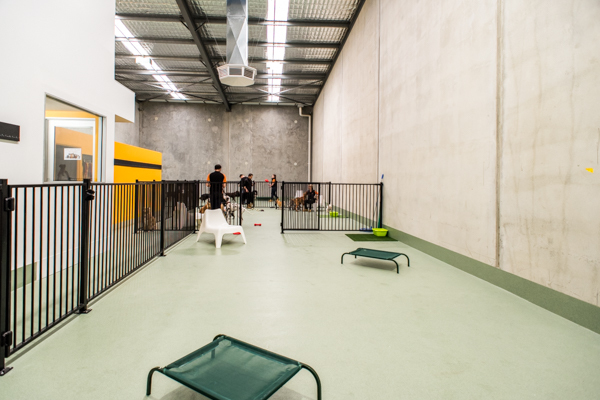 At Dogcity Daycare we only want the BEST for our dogs, so that means using the BEST possible flooring product on the Australian market. With a cost of close to $130,000 across our three facilities, our vinyl-epoxy flooring is the highest quality, non-slip, non-porous flooring available. While we could have opted for a lesser alternative, we never compromise on dog and staff health and safety. Why should you miss out on all of the fun!? At each of our facilities we have specific viewing areas where human clients can watch their furry counterparts in action. Our Viewing Rooms offer viewing access across our entire facilities and pens, so that you can watch some of the fun, action and play. Transparency is important to us; our facilities are fun, force-free and we value open dialogue with our human clients, being able to peak through and watch some of the action is a crucial component of this. Although it may be tempting to pull up a seat, and settle in for some cute doggy viewing, we suggest only staying a short while in our viewing areas. Extended periods can often be distracting to the dogs and take away from their experience… so sneak a peak, get your morning dose of doggy-goodness, give us a wave, and then head off to work with another reason to smile. *There may be times when our Viewing Rooms are closed, this may be because we are caring for dogs who suffer from separation anxiety (and seeing excited people can be triggering for them), we are in the process of our ‘Daily Doggy Relaxation’ or perhaps some of the pups are enjoying some quiet rest time. If you see the Viewing Room closed and still want to have a look inside, just ask one of our team, and if its appropriate, they will let you in.